…and it pops open to reveal 7 coin slots to keep change organized: 2 each for quarters, nickels, and pennies and 1 compartment for dimes. 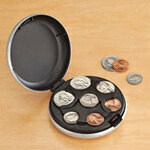 * Coin organizer is perfect for pocket or purse! * No more hunting through piles of coins. * 3 1/4”dia. 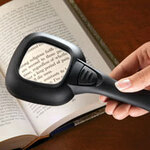 x 1 3/4”H size is comfortable to carry. * Plastic. 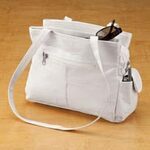 Stylish leather organizer handbag features cell phone pocket, three outer zippered compartments and outer pocket with hook-and-loop closure. 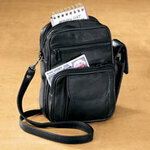 Organizer handbag has detachable strap and converts from 28 1/4"L to 51 1/2"L. Soft, genuine leather. 7 1/2"L x 6 1/2"W. Imported. Waistpacks ride near your center of gravity, making even the heaviest items easy to carry. 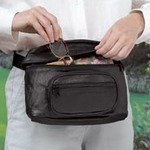 Large leather fanny pack has two front pockets for stowing small items, extra-wide adjustable nylon belt, and zipper closures. 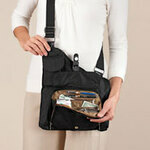 10"L x 6 1/2"H x 3"W. Adjustable waist strap expands to 45". 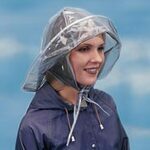 Our ladies rain hat protects your hairdo from inclement weather. 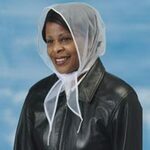 This white protective rain hat for hair has a flexible wide brim. Folds to fit in purse or glove box. Imported. …you wear these slim, undetectable silicone bra strap cushions. Secure easily under bra straps. Set of 2, medical-grade silicone bra strap pads prevents painful shoulder indentations, rubbing and chafing. Creates a soft shield from purse and luggage straps. Clear cushions measure 2" x 3 1/2" each. 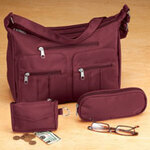 Durable, machine-washable handbag exterior features hook-and-loop compartment and 3 zip pockets. 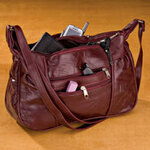 Handbag has spacious interior that features a large zip pocket and two easy-access openings. 12" L x 4 1/4" W x 9 1/2" H. Strap adjusts to 48". Polyurethane. Wash cold/warm, air dry. …without all of the mess! These irresistible IBC root beer float candy treats your tongue to the taste of rich root beer combined with creamy vanilla. Individually wrapped, these root beer candy barrels are the perfect for a sweet treat on the go and stay fresh in your purse or candy dish. 17 oz. 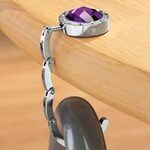 Bejeweled folding purse hook keeps your purse or cane off the floor, eliminating bending and tripping. Nonslip rubber base of purse hanger stays in place on a table or countertop. 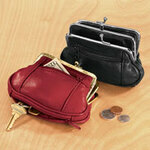 Purse holder hook folds flat to tote. 4" D X 2" H closed. …scraps. It’s your best protection against identity theft! These shred scissors have ten blades to shred important documents instantly: checks, bills, bank statements, carbons, credit card receipts. 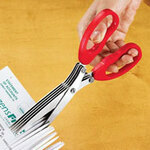 Shredder scissors fit in a purse or briefcase. Steel scissors with molded plastic grips are 7 1⁄2" L.
…faux-leather panels block RFID scanners to protect your credit cards from electronic transmission theft. * Ten card sleeves with easy-slide openings fan out for viewing and access. 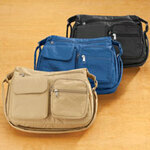 * Slim profile with elastic closure provides a sleek look and fits in a pocket or purse. * 4 1/4" x 2 3/4". * Vinyl. …flavors. Tootsie Roll Fruit Chews feature 5 assorted flavors: cherry, orange, vanilla, lemon and lime. Fill your candy dish with these individually wrapped fruit Tootsie Rolls, or tuck some away in a purse or pocket to keep your sweet tooth happy on the go. 12 oz. bag of flavored Tootsie Rolls.